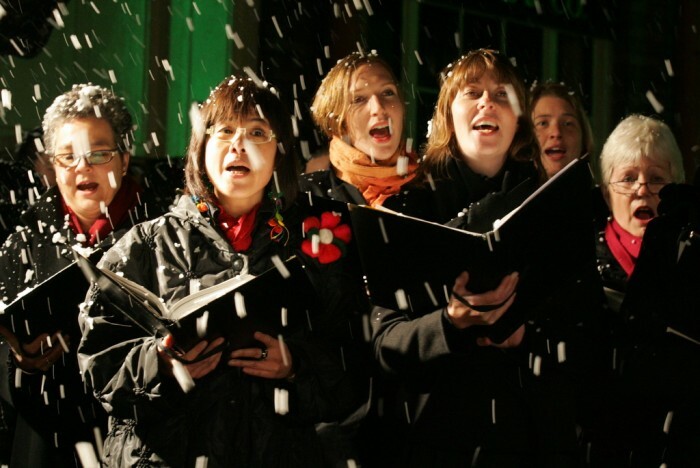 XcerptShow.com: Why do we sing carols at Christmas? Christmas as we have learned was a pagan holiday adapted by the church to unite countries under religion and make the transition more easy for new subjects/converts. What better way to win a popularity contest than to throw a party? There aren't many holidays that have their own songs. No one sings joyous tales about the Easter Bunny. Christmas is one that has a song list that just doesn't seem to go away. But why does Christmas have its own songs known as carols? The person who thought of Justin Bieber and the Chipmunks singing at Christmas, should be sent to Guantanamo under terrorism charges. From religious to secular, Christmas has a core of songs that everyone attempts to put their mark on...over and over and over again. The standard definition on Google is “a religious folk song or popular hymn, particularly one associated with Christmas.” Of course the definition is normalized for modern day interpretation. It doesn't tell us much about the word. Where does “carol” come from? How did the practice evolve? Early Christians would gather together on a particular day early in the morning and sing scripture to God like pagans would sing to their gods. This reminds me of popular sunrise services or morning mass on specific holidays. As Christianity grew and Catholicism(Remember, at the time, most of the Western world was Christian with a background in Catholicism) took over, singing carols were largely still pagan and looked down upon by religious officials. Catholic officials tried on at least two occasions, 7th and 16th century, to ban Christmas carols. Scrooge much? Puritans in England wanted to purify their religion of its unnecessary Catholic and largely pagan influence. In fact, in the 17th century Puritans banned all Christmas celebrations in England. This distilled version of Christianity is what pushed the first settlers of North America to give up the security of where they were, brave the unknown, risk their lives in the voyage and cross a vast ocean to start over. Their beliefs were so strong many early settlers didn't celebrate Christmas. The Christmas celebrations of the time were less about shopping and gift giving and more about getting drunk, think more Mardi Gras and less Santa Claus. A far cry from today's “traditional” Christmas. It was literature of the recent past that gave us many of the “traditions” that make Christmas what it is today with family, feasts and singing.